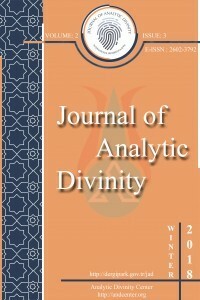 · Journal of Analytic Divinity is a peer-reviewed Journal published twice a year as June and December. · The Journal aims to contribute religious, theological, and social studies by publishing original academic works meeting international scientific criteria. The Journal publishes articles in Turkish, English, and Arabic. · All articles sent to JAD are subject to the double-blind peer-review process. Also, all the articles are checked by a plagiarism software to preclude any academic dishonesty. · With a wide publication coverage, the Journal that is a convenient platform for academic publications, has attracted the attention of a great number of researchers. ÜSKÜDARLI MEHMED NASÛHÎ HALVETÎ, SEYR Ü SÜLÛK MEKTUPLARI, HAZIRLAYAN: MUSTAFA TATCI, ABDÜLMECİT İSLAMOĞLU, İSTANBUL: H YAYINLARI, 1. BASKI, 2017, 448 SAYFA. · JAD accepts the Open Access Journal Policy for expanding and flourishing of knowledge.